Getty Images/Chip SomodevillaU.S. first lady Melania Trump (C) climbs back into her motorcade after travelling to Texas to visit facilities that house and care for children taken from their parents at the U.S.-Mexico border June 21, 2018 at Joint Base Andrews, Maryland. 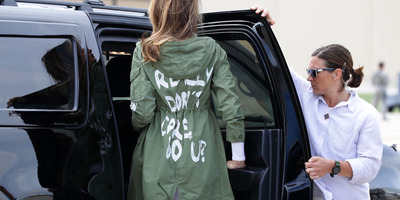 When first lady Melania Trump wore a jacket that said “I REALLY DON’T CARE, DO U?” to visit immigrant children in June, many thought the message might have been directed at the families who were separated at the border. But a source close to Melania told The New York Times that the jacket was actually directed at critics of her decision to visit the children. The first lady’s spokeswoman, however, told The Times that the jacket had no underlying message. The infamous jacket that first lady Melania Trump wore when she flew to Texas during the Trump administration’s family separation crisis had an entirely different meaning than most people believed, a source close to the first lady told The New York Times. The first lady attracted heavy criticism for wearing the jacket that read, “I REALLY DON’T CARE, DO U?” during part of her trip. Many believed Trump’s jacket was insensitive to the immigrant children she was visiting, who had been forcibly separated from their parents by the Trump administration’s “zero tolerance” policy. But the source told The Times that the message was actually directed at anyone inside or outside the White House who wanted to criticise her decision to visit the children. “Melania has learned how dishonest they are, and she truly no longer cares!” he tweeted. The first lady’s spokeswoman, Stephanie Grisham, has said repeatedly that the jacket wasn’t meant to send a message at all.